Patrons occasionally ask us questions about time capsules: Where should we put our time capsule? What should it be made out of? What should we put in it? It's probably best to begin by asking, What is your time capsule for? and What is a time capsule, anyway? Americans developed something of a craze for time capsules in the 1960s--increased suburban development and the incorporation of new towns, and the imminent threat of nuclear annihilation, one theorizes, gave rise to a frenzy of digging. New pools, new fallout shelters, new metal canisters strewn like so many dogs' bones under so many green lawns. Time capsules satisfy a kind of material longing best represented in former ages by funerary mounds, embalming, and pyramids: they are our way of casting objects forward in time, allowing our future selves to reach back in time, breathing in its musk. 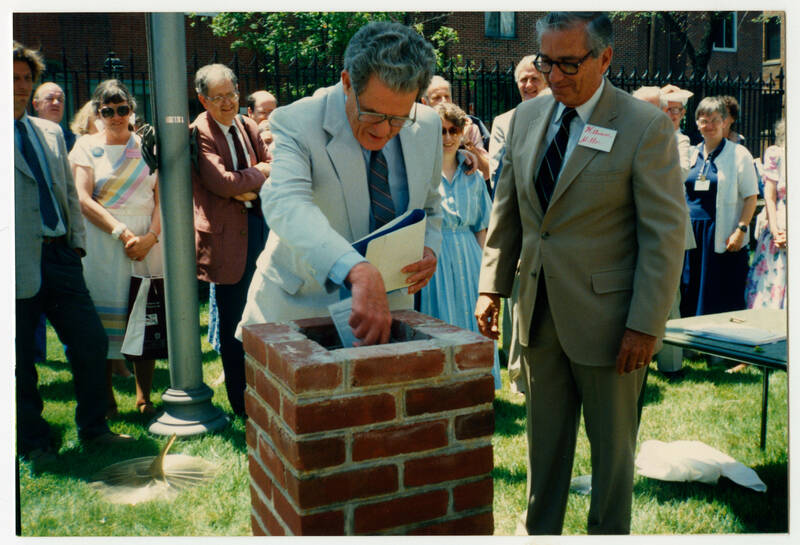 PHS director William Miller placing content in the time capsule, June 11, 1989. Opening time capsules tends to be done by accident, and tends to be done by work crews renovating active buildings. Time capsules tend to be forgotten; ours is exemplary in this way. They can be fantastically well-preserved. More frequently, water, earth, bacteria, and time do their ordinary work on them, and convert their contents into noxious sludge. Even the best-documented, most-beloved time capsules lose vital chunks of information. It's interesting to me that the Nazi time capsule recently unearthed in Złocieniec, Poland, purportedly had an original motion picture of the town inside it and is now lost, because it would have had a better shot at persistence being in an archives. (The film would have been captured by the Soviet Army and would now be in the Rossiiskii gosudarstvennyi voennyi arkhiv, but still.) 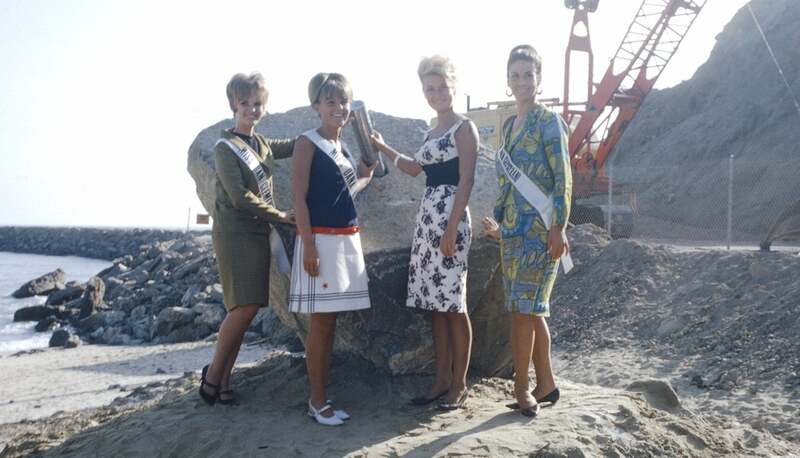 The Dana Point, California, time capsule is chiefly documented not by itself, but by the Orange County Archives. Time capsules are remarkably mute. They do not effectively document or prove anything about the past. Archives do that. 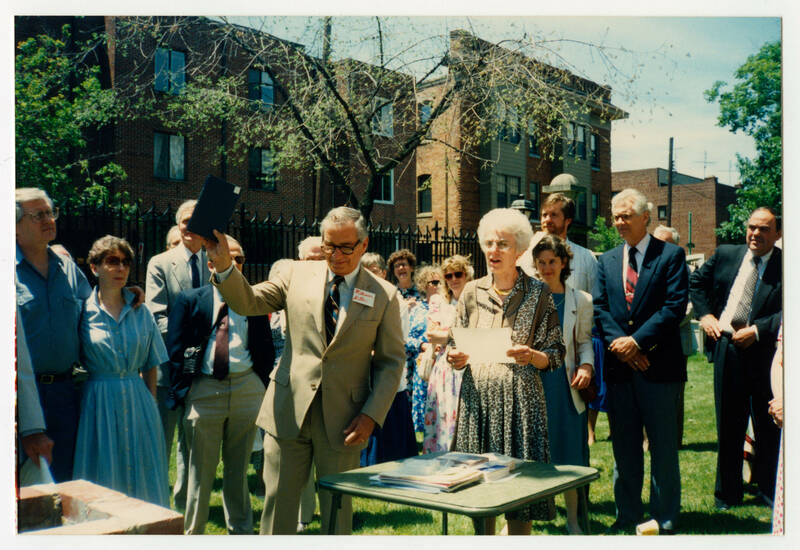 George Laird Hunt placing more content in the time capsule, June 11, 1989. Our capsule was placed on site to commemorate the 201st General Assembly of the Presbyterian Church, held in Philadelphia, Pa., site of the first General Assembly in 1789. Our director, William Bayard Miller, and our board chair, George Laird Hunt, led the ceremony, placing printed materials, including an issue of the Presbyterian Outlook, into the canister. Fortunately for us, we have documentation of the event, processed into Record Group 22. The capsule was intended to be opened on the denomination's 250th anniversary, at the 251st General Assembly. Now that there are biennial rather than annual assemblies, the anniversary year will not necessarily coincide with an Assembly year, so we've scheduled the capsule's opening for 2039, in accordance with what we think the Assembly's wishes might well have been. For now, it has been added to our database of temporary records, and shelved on one of the immobile aisles of our mobile compact shelving. 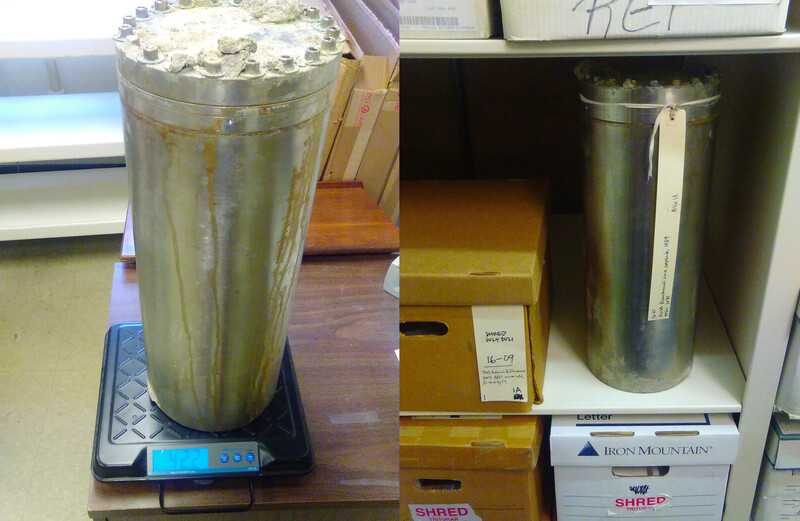 The time capsule, weighing in at 42.2 pounds; the time capsule, shelved among other temporary records. So, to review: do not put time capsules underground; the consensus is that they should be copper or stainless steel; leave information carriers out of them. What then, should you put in a time capsule, assuming you're dead set on the idea, you maverick with your devil-may-care attitude toward archival science? Probably not comestibles, because the information professionals who find them may eat them. Probably do not put live bacteria samples, nor vials of U-235, in them. Think about the things that entertain you the most when you see them in thrift stores, and vintage boutiques, and estate sales--wind-up toys and dancing hula girls, advertisements for cars and hair tonics. My own favorites are slide sorters, projectors, and carousels. Camp taste is a kind of love, love for human nature. It relishes, rather than judges, the little triumphs and awkward intensities of "character." Let us relish, therefore, rather than judge the time capsule, kind bearer of nostalgia. See you in June 2039. 14 hours 16 min ago. Today’s #HistoricalFigureFriday honors Reverend James Patriot Wilson. Born in 1769 in Lewes, Delaware Wilson went on to graduate from the University of Pennsylvania in 1788. He initially studied law and was admitted to the Bar but the unexpected death of both his wife and brother led him to a religious path. He was ordained as pastor of the Presbyterian Church in Lewes in 1804 and in 1806 he accepted a call to lead the First Presbyterian Church in Philadelphia. He resigned as a much celebrated pastor in the spring of 1830 before he died December 9th 1830. Our portrait of Reverend Wilson was painted in 1807 by none other than James Peale the younger brother of Charles Willson Peale. This oil on canvas painting represents one of the many large portraits James Peale completed after he shifted away from miniatures. To see more works by James Peale visit PAFA The Pennsylvania Academy of the Fine Arts or the Philadelphia Museum of Art.